On December 14th, the Federal Communications Commission (FCC) will vote to replace current rules enforcing net neutrality. Nothing short of an extinction-level event will prevent it. But before abandoning all hope, know that while the battle for net neutrality at the FCC may have been lost, the war isn’t even close to a conclusion. In roughly two weeks, the FCC’s three Republican commissioners, led by its chairman, Ajit Pai, will vote to adopt what’s known as the Restoring Internet Freedom Order. As the minority, the two Democrats who serve on the commission, both of which favor net neutrality, will be powerless to stop them. This order will replace and reverse the Open Internet Order, which was passed in 2015 and reclassified broadband internet service under Title II of the Communications Act—the legal foundation upon which the former administration established the “open internet” regulations imposed on internet service providers (ISPs). Without net neutrality, ISPs like Comcast, AT&T, and Verizon will legally be able to conduct their businesses very differently than they do now. For example, they could give preferential treatment to services they directly profit from and block those they don’t, all the while charging internet companies like Netflix additional fees for speedier access to consumers—costs that you can count on being reflected in your monthly billing statement. Publicly, ISPs claim the rules hinder innovation, a talking point frequently echoed by the FCC’s majority. Privately, we’ve learned, stockholders are being told the exact opposite. To be clear, when the FCC says that it is “restoring internet freedom,” it is not talking about your freedom or the freedom of consumers. The FCC’s new order, which seeks to abdicate its own authority to regulate an entire industry—not something you see every day—is unlikely to surface immediately after the vote. The two Democrats on the commission, Mignon Clyburn and Jessica Rosenworcel, will likely file dissents, or minority reports detailing why, specifically, they disagree with the 200-page order (a draft of which was released last week.) And when they do, Pai and his two fellow Republican commissioners, Michael O’Rielly and Brendan Carr, will likely take some time to counter those concerns in print, if only in preparation for the long legal battle that lies ahead. Afterwards, a brief period of legal chaos will ensue. Or at least, it will appear that way to anyone who hasn’t spent a decade with their face buried in legal textbooks. For certain, there will be numerous lawsuits—or “petitions for review,” more specifically—filed in reaction to the Restoring Internet Freedom Order. We can’t be sure of how many tech companies, trade associations, and interest groups will avail themselves of judicial system and demand scrutiny of the FCC’s plan, but we know that many will seek an outright reversal of the order. Others may challenge only portions of the order, such as the provisions which “preempt” state and local governments that may try to pass their own laws to protect consumers from ISP abuse. For many attorneys it’s “wait and see.” Much of the courtroom strategy, which no one is eager to reveal this early in the game, may be determined by the venue. That brings us to the first skirmish in this grueling legal process: Where will net neutrality’s fate be decided? While the Court of Appeals for the District of Columbia has heard three net neutrality cases in the past few years and therefore seems more appropriate, the case could theoretically wind up in one of eleven other circuit courts. In many ways it’s like winning the lottery, literally speaking. Petitions asking the courts to review the FCC’s order will be filed with appellate courts across the US. But only one court can hear the case. The process to determine which is, as one litigator described it, a “lawyer fight.” Organizations that want to be involved in the suit will have 60 days to file, but they’ll have only 10 days to get involved if they want a say in where the case will be heard. It’s not immediately clear when that 10-day window opens. In some cases, it’s opened the minute the FCC publishes the order; in others, the attorneys have had to wait until after the order is added to the federal register—the government’s daily journal in which all rules, proposed rules, and public notices are published. To avoid any confusion, the litigants who are truly determined to have a say in jurisdiction are likely to file what’s called a “protective filing” at the earliest possible date—only to file again after the order hits the federal register, which may take a couple of weeks. The reason for this 10-day window—during which all filings are considered to have been filed simultaneously—is pretty simple: In days past, jurisdiction was determined by whomever filed first. But with lawyers filing in multiple states simultaneously, the process for deciding which attorney crossed the finish line first became unrealistic. And so the courts decided to leave it up to chance. After the 10-day window, each circuit district in which a lawsuit has been filed is entered into a lottery held by the Judicial Panel on Multidistrict Litigation. “They plug into a computer the circuits which are competing and it picks a random number and that’s where they then assign all of the cases,” Feld said. Each circuit court is only entered into the lottery once, regardless of how many individual suits were filed there. 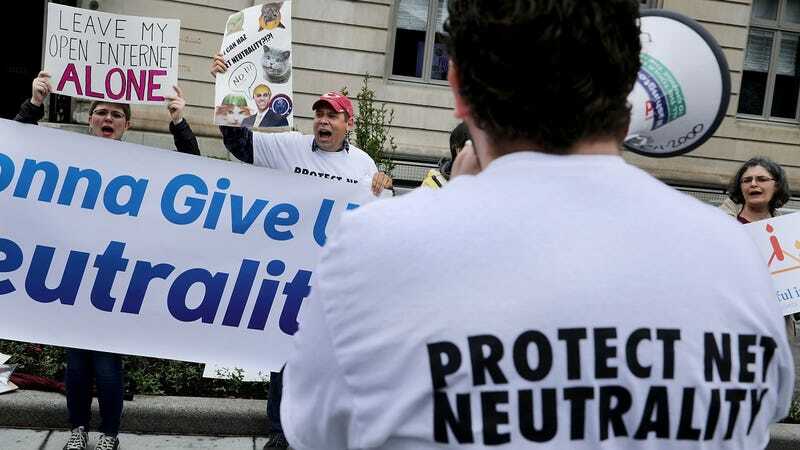 While the FCC does not have a say in this process (they aren’t suing themselves) there is an opportunity for those who oppose net neutrality to get involved—but only if they’re willing to object to some provision in the FCC’s order. Gigi Sohn, a former counsel to ex-FCC chairman Tom Wheeler, said the draft order didn’t appear to contain anything the ISPs would be eager to appeal at first blush. “I’m sure they’ll try to find something,” she said. By finding some small point to sue over, she added, the ISPs can increase the odds of getting the case into a more favorable court. But this could also backfire, others say. “If they were to do something like that, it might carry the unfortunate perception of forum shopping on their part,” said Pantelis Michalopoulos, a telecom partner at the law firm Steptoe & Johnson LLP. In other words, if the lottery selects, for instance, the Court of Appeals for the Sixth Circuit, which includes the the states Kentucky, Ohio, Michigan and Tennessee, one or more of the parties involved may, hypothetically, argue that the DC court is better equipped due its experience handling net neutrality cases. But how that would play out for either side is a bit of a toss up. “It’s interesting, because until Obama appointed a couple of new judges, the DC circuit was considered to be very anti-regulatory and very pro-business,” Feld said. But that largely changed in 2014 after Obama appointed three judges who typically deferred to the agency. Of course, the FCC could draw a panel of friendly conservative judges in DC and have a breezy time of it. But whether a challenge like this will occur or what effect the venue will have on the case is largely a matter of speculation for now. As for any parties who didn’t participate in this initial scramble, they’ll still have that 60-day window to join the case, or else as an intervener—a non-party the court grants may be affected by the outcome, on either side of the case. This could mean a trade group representing tech giants like Google or Netflix—if they don’t join the lawsuit itself, which they certainly may—or it could be a group representing AT&T, Verizon and the like. When we eventually get to court, one or more of the litigants, perhaps one of the smaller tech companies that joins the suit, may ask the court to issue a preliminary injunction, or what the appellate courts called a “stay.” If granted, this would prevent the FCC’s order, or perhaps just portions of it, from going into effect until the court renders a decision. The challenge for anyone seeking a stay, however, lies not in demonstrating long-term harm from the rules, but imminent and irreparable injury. For this reason, many experts believe it is unlikely the ISPs will jump at the opportunity to launch any new business plans taking advantage of their newfound freedom. Doing so could inadvertently aid anyone petitioning for a stay, providing them with a real-life example of how the ISPs new behavior will irreparably damage their business. The remainder of the case should play out rather simply, though it remains unclear whether the parties opposing the FCC will be bundled together, or able to argue their cases independently. This depends on the rules of the court in which they convene and, potentially, on whether or not the litigants’ complaints about the order are dramatically divergent. Regardless, we’ll hear (or read, at least, since recording devices are banned in the DC court and others) a series of oral arguments for and against Pai’s order. Outside parties will also have the opportunity to file amicus briefs, also known as “friend of the court” briefs, defending or opposing points of the order. In the case that court does not side entirely with the FCC, that decision may be an outright reversal of the order, a remand to the agency for further proceedings, or just a partial remand. In other words, there’s a distinct possibility that only portions of the Restoring Internet Freedom Order will be reversed. Or maybe none of it. And there’s always the chance this ends up in the hands of the Supreme Court, whose makeup by that time may be entirely different. The judicial review of Pai’s order could very well extend into the next White House administration. The war for net neutrality in other words has only just begun.